The 2018 World Series is here. The Boston Red Sox, favourites in the American League all season, easily topped the Houston Astros in the ALCS to advance. Meanwhile, the Los Angeles Dodgers defeated the Milwaukee Brewers in a seven-game NLCS to reach their second straight World Series. Can Kershaw, Price change the narrative? Clayton Kershaw and David Price have long been two of baseball’s best pitchers. While they have each had high points during October, both have been mediocre in the playoffs throughout their careers. They could change that narrative in the World Series. Kershaw entered this postseason with a 7-6 record and a 4.35 ERA. He threw eight shutout innings in the NLDS and seven innings of one-run ball in the Dodgers’ Game 5 NLCS win over the Brewers. He also pitched a scoreless ninth inning in their Game 7 victory. However, Kershaw did surrender four earned runs as he took the loss in the series opener. On the other hand, Price - who has a 3-9 career postseason record - was tagged for seven total earned runs in his first two 2018 playoff starts before he threw a six-inning, three-hit gem in Boston's ALCS-clinching Game 5 win over the Astros. 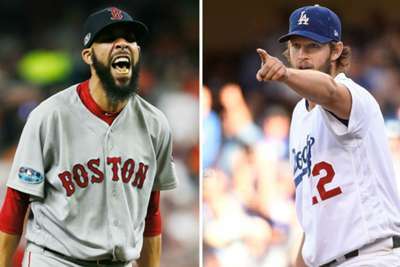 The pair have combined for four Cy Young awards and 12 All-Star appearances, but only one will get to add a championship to their resume at the end of this series. Will Chris Sale be himself? Boston starter Chris Sale was limited to just one appearance in the ALCS as he was hospitalised with an illness, which he said was caused by irritation from a belly button ring. Sale is set to start Game 1, yet the illness still forced him into an extended layoff. He will go 10 days without taking the mound. Sale tallied a 12-4 record with a 2.11 ERA in the regular season and made his seventh consecutive All-Star team. The Red Sox will need their ace to be in top form if they want to win the ninth World Series title in franchise history. The Red Sox will have to make some crucial lineup decisions when they play at Dodger Stadium. Boston will not have the benefit of the designated hitter in the National League park, meaning it will have to take one of its big bats out of the lineup. J.D. Martinez, an American League MVP candidate, typically serves as Boston's DH but manager Alex Cora said he will move to the outfield for road games in this series. That means the Red Sox will either have to bench Jackie Bradley Jr. - the ALCS MVP - or Andrew Benintendi, who went .290/.366/.485 in 148 regular-season games. The Red Sox are also considering using star Mookie Betts at second base, a position he played in the minors.